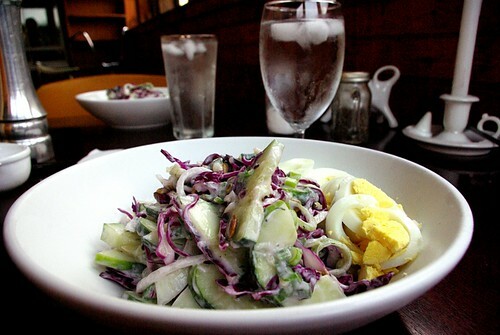 yogurt cucumber red cabbage and dill salad with hard boiled egg, originally uploaded by aarn! +5th August, 2009+. brought a pot of water containing three eggs to a boil. after reaching a boil, let the pot sit, removed from heat for 10-minutes. then removed the eggs, chilled, peeled, and sliced. mixed together 2 cloves of crushed garlic, 3/4c. of lowfat plain yogurt, 2T. of mayonnaise, 1.5t fresh chopped dill, and a pinch of salt and pepper. tossed in the dressing one thinly sliced spring onion stalk with a large bulb (with a little of the greens), one large cucumber, 1/2 of a small red cabbage, and whole toasted pepitas. plated the salad in some chilled bowls with a side of hard boiled egg. great stuff! Looks amazing aaron!